Where to eat near the Camp Nou? Tickets FC Barcelona Tickets Tips & Tricks where to eat near the Camp Nou? 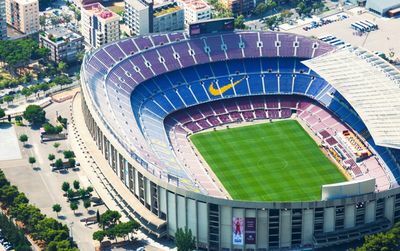 Whether you're in the Corts district to do the Camp Nou Tour, or to assist an FC Barcelona match, it's good to know the local addresses to avoid the many pitfalls. Between the “fast food” with poor quality products and high prices tapas restaurants, or bars with no interest, the tourist is expected to fall into the trap. It is predictable, that these type of places, would be close to one of the most visited places in Barcelona. We have chosen for you these small and highly recommended addresses that will plunge you into a family and festive atmosphere, as are all the Barca matches and visits to the stadiu. A before match for FC Barcelona fans! As its name indicates it, Futballarium is the temple of the amateurs of football within a walking distance from Camp Nou stadium. The evenings of FC Barcelona match this pub and restaurant is taken by storm in an environment more than friendly. One evening with the Barça is a little like a mass, there are certain traditions to respect. To drink a beer before the match is part of it. 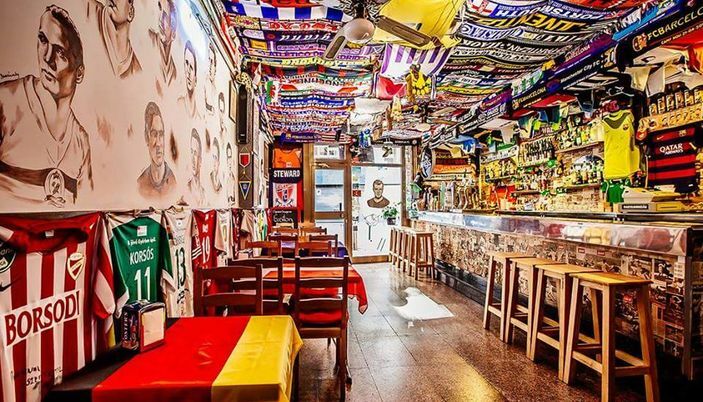 The owner of the places is fan of football, you will discover in his bar his collection of more than 100 shirts and 400 scarves bearing the effigy of its preferred teams. To hold its row of fans of football it will present also his collection of alcoholic beverages: all kinds of draught beers, bottle beers with in particular its own beer « Futballarium » of course, of irish whiskeys, scottish wiskeys. The list is without end. As regards catering, dishes are made for sportsmen in terms of quantity at least: Futballarium for example is composed of meatballs, onion boxing rings, sweet stuffed jalapeno peppers, salad and potatoes. It is consistent! Enough to shout loudly during 90 minutes, without any problem. Need FC Barcelona Tickets ? Visit our shop! Opening hours : Every day from 9 to 21 hours. The most fashionable. Opened by the starred chef Carles Abellan, you can eat sublime hamburgers at normal prices ! 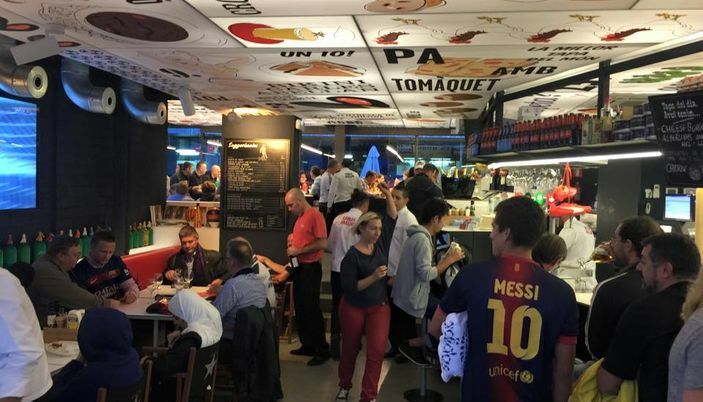 Soccer fans here's a new good reason to go to the Camp Nou, the opening of a new Carles Abellan’s fast-food: Tapas, 24 Camp Nou! Carles Abellan is the catalan chef who successfully opens restaurants in Barcelona: from Comerç 24 its first one to the last Yango. With this second Tapas, 24 in Barcelona the Chef sublimes traditional tapas with his well-known findings like: « Las 'nuestras bravas', las bombas de la Barceloneta, el Bikini Carles Abellan, la McFoie Burger ».. Innovative and delicious, we also like the menu at € 15 at noon. 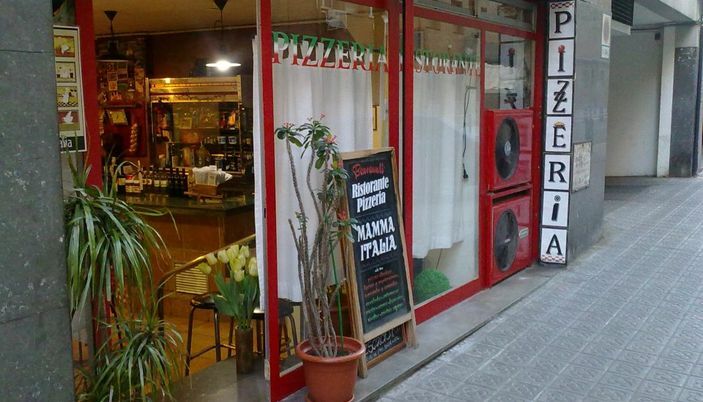 The most family-friendly: a pizzeria run by an Italian fan of football, pasta and good atmosphere. Small prices, very good and friendly! To put the whole family together before or after a game at Camp Nou nothing like a good pizza or Italian pasta. Mamma Italia is in the neighborhood of Corts a very good address to remember. Like all the real pizzerias the wood burning oven is only turned on at night during the weekdays - because it is expensive - but as we are close to Camp Nou there are two services - noon and evening - on weekends. In a corner a TV is connected to the FC Barcelona matches, ​​but you are well in Italy. The pizzas are really excellent, the locals come to take them away, it is a sign that does not deceive. The secret is however very simple: use only ingredients of very good quality and a know-how for the dough. The prices of the pizzas are normal from 5 to 11,50 €. The most complicated will perhaps be to find your pizza in a list that seems endless but that will satisfy all lovers. The pasta is also delicious with a good number of classics ranging from lasagna to tortellini and tagliatelle..
New at Camp Nou for 2018!